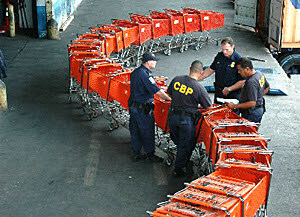 Using X-ray technology, U.S. Customs and Border Protection officers recovered 30 stolen shopping carts worth about $3,000 in a cargo container transiting through the Port of Miami from Ontario to Trinidad and Tobago, the agency said Friday. The carts belong to Home Depot and will be returned to the company, the agency said in a prepared statement. Now we know where all the shopping carts go. Trinidad & Tobago! Back years ago, Winn-Dixie used to have employ a person who would roam the areas around where a store was located, looking for carts. I worked for the chain back in high school, and a manager sent me out with the guy. We found like seventy carts at the apartment house across the street from the store. People would bring their groceries home but never bring the carts back. Now who's going to retrieve Home Depot's carts and return them to the stores? I think the government is done enough already. Let the chain store pick them up.